(Newser) – A man armed with a pistol walked into an Oklahoma City restaurant at the dinner hour Thursday and opened fire, wounding two customers, before being shot dead by a handgun-carrying civilian in the parking lot, police say. 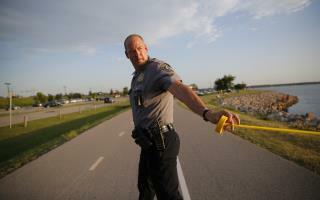 The shooting happened around 6:30pm at Louie's On The Lake, a restaurant on Lake Hefner, the AP reports. A woman and a female juvenile underwent surgery for gunshot wounds but apparently "are going to survive," says Capt. Bo Matthews, a police spokesman. A man suffered a broken arm while trying to escape the shooting. A family member told KOCO-TV that her daughter and 12-year-old granddaughter were shot while entering the restaurant for the girl's birthday dinner. Authorities have not identified the injured patrons.The dead suspect's identity also was not immediately known, Matthews says. "We have no reason to believe this is a terrorist type of incident," Matthews says. The motive was unclear otherwise, and law enforcement personnel plan to interview about 100 eyewitnesses, he says. "Right now, all I know is that it was just a good Samaritan that was there and looks like he took the right measures to be able to put an end to a terrible, terrible incident," he tells CNN. Good. Now let's see Korea make peace with itself. Note that the shooter was only killed AFTER he had already shot his victims in the restaurant and had left. As usual, guns didn't stop anyone from shooting more people. Right on. Let’s deal with the schools in the same way. Arm the teachers.